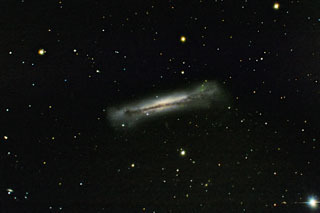 NGC 3628 is an edge on spiral galaxy in Leo. Often called "Sarah's Galaxy" and the "Hamburger Galaxy", it is the third galaxy of the Leo Triplet. Its companions are M65 and M66 and the three bright galaxies are within about 2/3 of a degree of each other (the full moon is about 1/2 degree). 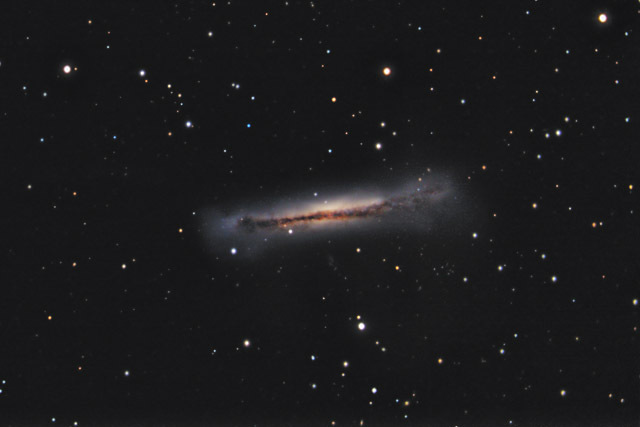 NGC 3628 displays a beautiful dust lane bisecting it. Very long exposures can reveal the "tidal tail" - a string of stars and gas that extends to the west by almost a degree (about 4 times the diameter of the galaxy itself!). The tidal tail is caused by the gravitational interaction with M65 and M66. In this image, North is Up. This image is cropped to 54% of the original full frame. Software Used Images Plus 4.5 for camera control, Images Plus 4.0 for calibration, stacking, digital development, and multiresolution smoothing. Photoshop CS5 used for flat fielding, levels and curves, color balance, high pass filter, star shrinking, saturation adjustments and noise reduction. Carboni Tools for additional saturation adjustments and noise reduction. Notes I photographed this galaxy for over 16 hours in hopes of capturing the elusive tidal tail. As it happens, 16 hours still wasn't quite enough to image anything more than a hint of the tidal tail. I haven't given up on the tail, as I plan to add more time to this object in the upcoming months. I'm determined to capture the tidal tail. Nonetheless, I figured I had enough data to make at least a pretty decent image of the galaxy. It isn't optimal, as I had the galaxy in the corner of the field of view in order to capture the tail going through the center of the image. As such, the galaxy wasn't positioned in the optimal part of the telescope's optical path. That having been said, I think the image still came out rather well (although its not as precisely sharp as it could have been). This image won 1st place in Cloudy Night's February 2012 DSLR Imaging/Sketching contest.